On Sunday, Cheryl, Robert and I greeted an early morning and a beautiful blue sky to hike the Mineral Ridge Loop just outside of Harrison Idaho, about 20 minutes away from Coeur d’Alene. This was my first time doing this hike, and I was pleasantly surprised to see that all of the wonderful things I had heard about this trail were absolutely true. Mineral Ridge is located on the east side of lake Coeur d’Alene, near Beauty bay. It is part of the Coeur d’Alene National Forest area. The Scenic Area at the bottom of the trail has wonderful landscape, drinking fountains, covered picnic pavilions, pit toilets and garbage receptacles. The Mineral Ridge Boat Launch also lies below the Scenic Area, where fishing is a popular activity. The hike itself is a self-guided 3.3 mile uphill loop, with plenty of switchbacks and nicely groomed trails along the way. The trail is mostly shaded with a moderate incline to the top. There are many benches put in place along the way for stops and has incredible views at many points during the hike. Diverse, lush vegetation is rampant throughout this forest environment, and the primary tree species you will find here are the Ponderosa Pine and the Douglas-fir. Each winter, from November to February, the migrating population of up to 150 bald eagles visit the area to feed on spawning kokanee salmon. Unfortunately, we did not catch a glimpse of any of the bald eagles, but being that February is coming to an end, we may have just missed their feeding season. An interpretative viewing program is offered during the peak season between Christmas and New Years annually, for those of you interested in going next year. As we ventured toward the top, we ran into a bit of history that lies within the Mineral Ridge Trail. Robert explained how miners who came to this area during the Gold Rush began to dig large holes in the ground in hopes of striking it rich. These holes are very apparent and along the trail they have guided markers explaining different pieces of history that Mineral Ridge holds. The Wolf Lodge Bay is the view that you hike up the trail for. 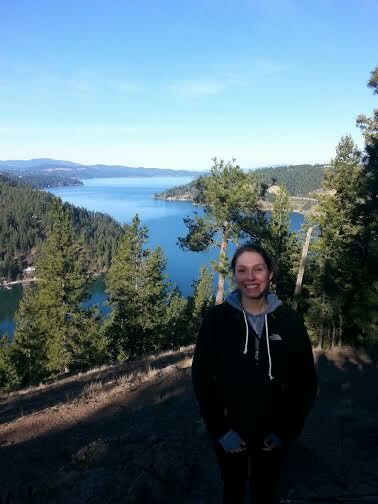 An absolutely stunning view of Coeur d’Alene that stretches for miles greets you as you reach the top of the hike. This site is situated at an elevation of 2,824 feet, about 700 feet above lake level. For a late-February morning, this hike could not have been more enjoyable. A tad bit chilly, but with plenty of sunshine, made this excursion quite refreshing. Check out some pics I took from the top. To get to Mineral Ridge, head east on I-90 from Coeur d’Alene toward Harrison. Take exit 22 for Harrison/Wolf Lodge Bay. Then head south on State Highway 97 for 3 miles. The trail head is at the Mineral Ridge Scenic Area on the left side of the highway. You will see the parking area and trail head. Have fun! Be sure to comment your experiences at Mineral Ridge on this post! 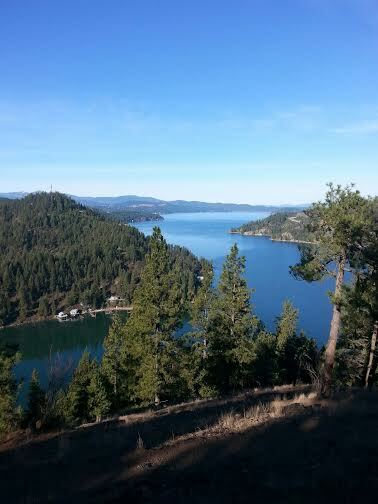 What other hikes do you love in the Coeur d’Alene area?